Have an extra $10 million in the bank at the moment? Rather than parking that money in the housing market in London, why not think of investing it in some fancy diamonds instead? Only these aren't just any diamonds. They don't go around your neck and they won't work unless you have the exact dimensions of a Victoria's Secret Angel. Yes, we're talking about the one and only Victoria's Secret Fantasy Bra and this year it's blinging more than ever with the biggest price tag yet. 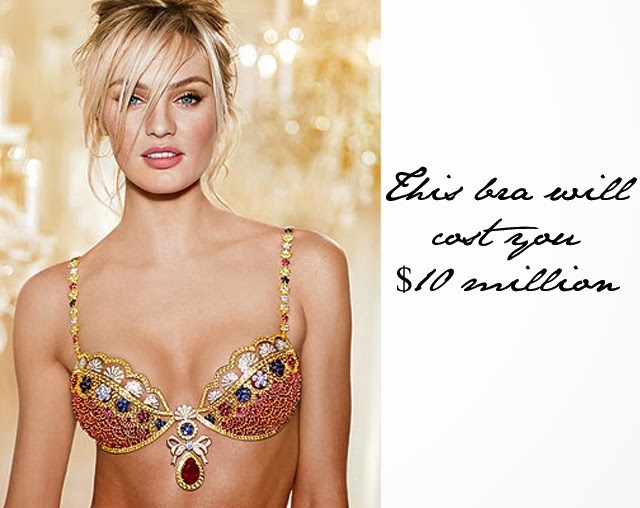 Made of 18-Karat Gold and containing 4,200 precious stones, the Victoria's Secret Fantasy Bra will be modelled by Candice Swanepoel in the 2013 Victoria's Secret Show. Sure hope she has some bodyguards on hand for when it's time to slip into this little number.